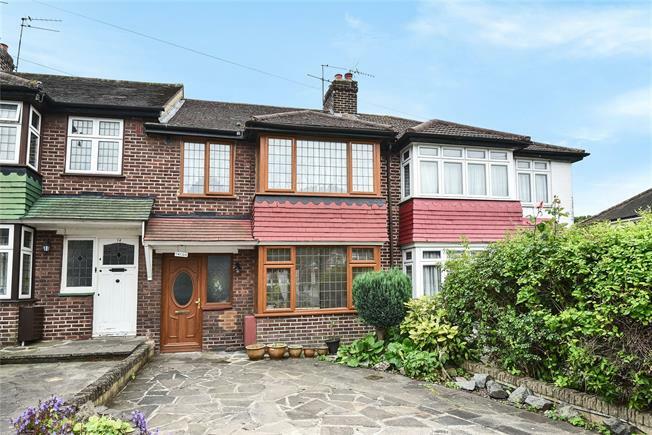 3 Bedroom House For Sale in Bromley for Guide Price £425,000. This three bedroom mid terrace bedroom family home is offered in good condition throughout and is situated in a popular residential area. The accommodation briefly comprises of; welcoming hallway with understairs storage cupboard, spacious through lounge/dining room with wood burner and patio doors onto the garden, extended fitted kitchen with door to the garden. Upstairs offers two double bedrooms, a further single bedroom and a family bathroom. Externally there is a lovely, private rear garden which is mainly laid to lawn with patio area. Additional benefits to the property include off road parking to the front, a garage to the rear, double glazing and gas central heating. The property is situated in a convenient location for Bromley town centre and is 1.2miles to Grove Park station which offers direct access in central London, there are also a number of well-regarded schools and an array of local amenities close by. Viewing is highly recommended.